Enjoy this inviting family Duplex, with resort facilities to soak up and the delights of Ispra on the doorstep! Perfect for stress-free getaways, this practical resort Duplex for 4-6 places guests in a highly desirable setting on Lake Maggiore. Located in the well-serviced lakeshore town of Ispra, this 2 bed retreat is fully-equipped to get your self-catering stay off the ground. Its spacious open plan Living room with garden access also offers a fully-equipped Kitchen Diner; for relaxed meals in, whilst the terrace outside conjures up classic BBQ and sunbathing moments. A spiral staircase leads to the first floor, where a spacious Double bedroom with balcony features alongside a 2nd Bedroom with balcony access and a Single bed with pull-out option. A Double sofa bed can also be utilised to the Ground Floor Living room. A spacious Bathroom is accompanied by a second shower room and laundry facilities. Outside, the child-friendly resort offers a wealth of activities to complement your stay, including a large park with kids play area, an outdoor pool with showers, sun loungers and pleasant shady areas. Clay tennis courts also offer the perfect opportunity for you to practise your serve (for a small charge), whilst just 500 metres away from the resort, a lakeside promenade leads to boat mooring, a boatyard and a fitness centre with gym, spa and Olympic size swimming pool. The lake beach and trekking trails here also let you immerse yourselves in an enjoyable Ispra day, whilst the many shops, ‘gelatarias’, supermarkets and local historical gems provide everything that you could wish for in a pretty lakeside town. From Ispra, guests are under a 16 minutes’ drive from the UNESCO World Heritage site of ‘Santa Caterina del Sasso’, as well as the resort town of Laveno (which offers ferry links to Stresa and Verbania). Many activities can be enjoyed in the local area too; from water sports, boat trips, power boat rental and beach days to hiking, golf, fine dining, canoeing, Aqua parks, Swiss Alp skiing and more! Milan Malpensa is also just 32 minutes’ drive away; making this the ideal location for accessible year-round stays. The holiday apartment is perfectly-equipped for flexible family groups of 4-6. • For multiple groups staying, the holiday home is also in the same resort residence as Riva del Caolino (Ref 1332), Il Faggio (Ref 1417) and Casa Azalea (Ref 1455)! The holiday home boasts its own covered terrace with alfresco bistro set and BBQ. The private sunny lawn garden also offers a lovely setting in which to unwind; with 2 sun loungers to hand. Within the communal grounds of the residence, guests can soak up the enjoyment of the large outdoor swimming pool (free entry is given for up to 4 guests), the kids play area and the onsite clay Tennis courts (subject to a small charge). Swimming pool opens 2nd of June in accordance with weather conditions and closes 11th September. Tennis fee 5.50 euro per hour needs to be booked 24 hr's in advance. From the resort, a beautiful lake promenade offers access to local boat mooring, a fitness centre and a lovely lake beach (500 metres away), as well as access to many delightful walking routes. The historical village setting of Ispra is truly picturesque; with noble villa gardens and ancient ruins surrounding the lakefront resort. Home to authentic Italian restaurants, shops and well-stocked supermarkets, Ispra truly lets you wine and dine your holiday away. The famous Monastery of ‘Santa Caterina del Sasso’ is just a 13 minutes’ drive away, whilst the popular resort of Laveno is 16 minutes’ drive away. From the lovely golden triangle town of Laveno, a ferry service runs to Stresa and Verbania; for a lovely opportunity to enjoy a day of sightseeing. 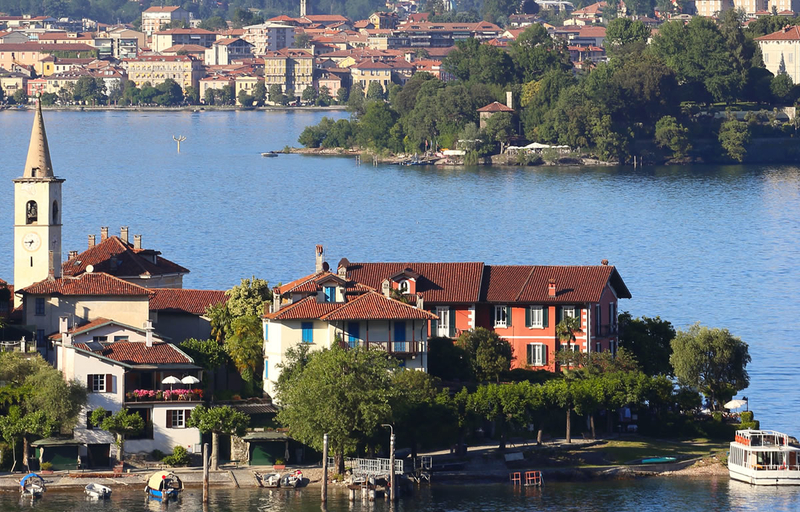 A holiday on Lake Maggiore offers a truly breathtaking experience; with water sports, boat trips, power boat rental and hiking to enjoy alongside swimming, golf, fine dining, botanical garden attractions, shopping, wine tasting, canoeing, water sports, aqua parks, Swiss Alp skiing and more! Milan Malpensa is conveniently 32 minutes’ drive away from Ispra. The easy driving distance to Milan, Lugano and Como all make this a fabulous setting for enjoying both relaxed and more explorative stays in the Italian Swiss Lake region. Please note, the swimming pool is free for a maximum number of 4 guests.Every extra guest pays 5 Euro per day. Swimming cap is mandatory and the pool is open from 10:00 to 20:00. EXTRA TO BE PAID LOCALLY: Heating when needed; euro 10 per day.